I am such a grazer. Most days I could get by without any meals, if I had enough food to graze on. Every time I go through the kitchen, I need a bite of something. This can be a nasty habit depending on the snack and food choices we have on hand! I am always on the lookout for bite size snacks that can help me stay away from the sugar cookies! I stumbled across this yummy recipe and fabulous blog, thanks to Pinterest. Pinterest is the new go to website, isn't it?? Delightful Country Cooking has some wonderful recipes, you should check them out! 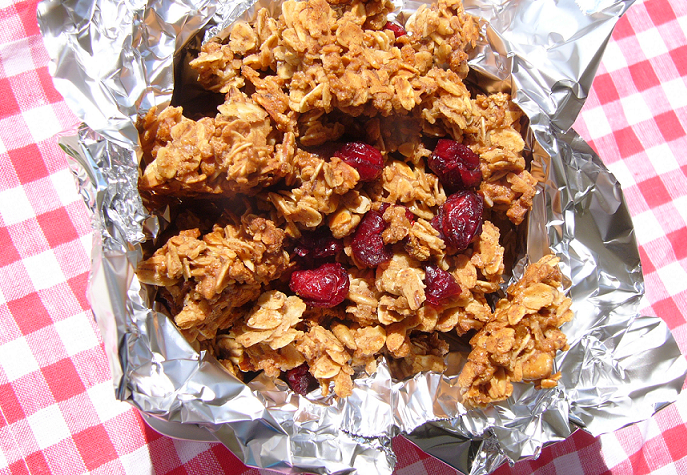 I tweaked her recipe, for my Peanut Butter Granola, that is my new addiction! Combine oats, almonds, and sunflower seeds. Spread on cookie sheet, lined with parchment paper. Bake at 325 degrees for 15 minutes. In large bowl combine Grape-Nuts, butter, peanut butter, ground flax seed, cinnamon, and honey. Add the oatmeal mixture; mix until well coated. Spread on cookie sheet lined with parchment paper. Bake at 325 for 20 minutes. Cool. Once cooled, break the granola into small bits and stir in dried fruit**. Keep in an airtight container for up to 2 months. **If you would like to make your own dried bananas, follow the instructions that Delightful Country Cooking has on her recipe. Simple, and fantastic idea!